Take a journey into the Weddell Sea's ice-filled waters, navigating vast tabular bergs and breaching whales, before discovering the Peninsulas' western flanks - a trip that combines the best of both worlds. In this frozen area of extraordinary beauty, powerful orcas and leopard seals patrol the waters, while ethereal snow petrels grace the skies against a backdrop of bristling mountain ranges and surreal icebergs. Get ready for an exciting Antarctic adventure, complemented by powerful whales, shimmering mountain ranges and mesmerising icebergs. Arrive in Punta Arenas, where you will be transferred to your downtown hotel. Overlooking the Straits of Magellan, the city sits astride one of the World's most historic trade routes. Today, Punta Arenas reflects a great mix of cultures, from English sheep ranchers to Portuguese sailors and it remains a fascinating testament to Chile's rich history. Tonight, we will gather to meet our fellow expeditioners for a briefing on the first leg of our expedition - our flight to Antarctica! This morning you will be transferred to Punta Arenas airport for your early morning charter flight to King George Island, Antarctica, the flight will take approximately one-and-a-half-hours. On arrival at King George Island, the expedition team will be on hand to greet you and provide you with gumboots for your Zodiac transfer to board the MV Greg Mortimer. You'll have time to settle into your cabin before the important ship briefings. You will be able to spend the evening getting to know your fellow expeditioners and friendly expedition team at a welcome dinner, celebrating the start of a thrilling adventure to Antarctica. Please note, King George Island is located at the northern tip of the Antarctic Peninsula in the South Shetland Islands and is one of the most remote places on Earth. A clear sky with perfect visibility is required in order to take off and land safely so delays can occur. While settling into our cabins and familiarising ourselves with the ship, we will head through the Antarctic Sound to the eastern side of the Peninsula, reaching the Weddell Sea. Access to the Weddell is heavily dependent on ice conditions, and our experienced leader will use their expertise to design our voyage from day to day. Over the next eight days a host of choices are open to us and depending on ice and weather conditions, both flanks of the Antarctic Peninsula, is ours to explore. Our experienced expedition team, who have made countless journeys to this area, will use their expertise to ensure that we make the most of the wildlife and landing opportunities, that present themselves along the way. We aim to make landings or Zodiac excursions two to three times a day. Days will be spent cruising along spectacular ice cliffs, following whales that are feeding near the surface, and landing on the continent and its off-shore islands to visit penguin rookies, seal haul outs, historic huts, and a few other favourite spots along the peninsula. Situated on the eastern side of the Tabarin Peninsula, the spectacular 745-metre promontory of Brown Bluff, towers over some 20,000 nesting pairs of Adélie penguins and hundreds of Gentoo penguins. Nesting skuas, snow petrels and pintados inhabit the upper slopes and kelp gulls screech overhead. Brown Bluff's volcanic origins have created some fantastically shaped boulders that lie scattered across the ash beach and make colourful nesting sites for some of the penguins. This tiny volcanic island forms the nesting grounds of some 120,000 pairs of Adélie penguins and the surrounding seas literally teem with penguins. There is also a blue-eyed shag colony situated at one end of Paulet's long beach front. Leopard seals are often seen cruising offshore, in search of their next meal. Weddell seals sometimes haul out here for a quiet nap on the beach. Apart from its plentiful wildlife, Paulet is also rich in the history of Antarctic exploration, for it was here that the 22 men of Larsen's Antarctic ship arrived on 28 February 1903 after their ship had sunk. The men wintered on Paulet, living on penguins and seals until eventually Larsen and five of the men rowed across Erebus and Terror Gulf to be reunited with members of Otto Nordenskjold's geological exploration party. Separated from the Trinity Peninsula by Prince Gustav Channel, the beaches and rocks of this mighty island are a mix of volcanic and sedimentary; creating a geologists' paradise. The beaches are populated with kelp gulls while Antarctic terns and skuas nest on the island's higher slopes. Many of the island's rocks are decorated with bright red and orange lichens, presenting fantastic photographic opportunities. Ice floes in the surrounding waters provide temporary floating homes for Weddell and Leopard Seals. We may walk up to Hidden Lake, following a stream rich in fossilised remains of deciduous trees, ferns, and even clamshells. If ice conditions and time permit, we may also circumnavigate this fantastic island; a rarely-accomplished feat. This very rarely-visited island was named for its two striking peaks or 'horns'. It is the nesting site for some 10,000 pairs of Adelie penguins. If weather conditions permit, we may walk up a scree slope to the top of the island's western peak. A few hundred metres in height, the summit provides superb views into Erebus and Terror Gulf. On the upper slopes, you may even see nesting snow petrels and Wilson's Storm Petrels. For those who are less active, the continuous commute of penguins on the beach and the accompanying skua population provide endless fascination. We may also cruise in our zodiacs amongst the large numbers of icebergs that are often grounded offshore. Because we are so far south, you will experience approximately 18-20 hours of daylight and the days can be as busy as you wish. We will generally make landings or Zodiac excursions two, and occasionally three, times a day; cruising along spectacular ice cliffs, following whales that are feeding near the surface, and landing on the continent and its off-shore islands to visit penguin rookeries, seal haul outs, historic huts, and a few other favourite spots along the peninsula. There will be plenty of time for sleep when you get home! There will be plenty of time to enjoy the sheer beauty and breathtaking scenery of this magical land, with it's impressive glaciers and rugged snow-capped mountains. You will have plenty of time to walk on shore amongst the hundreds of penguins, or to enjoy a Zodiac cruise and simply soak up this wonderful landscape. The peninsula has a remarkable history and during the voyage, we will learn more about the incredible expeditions to these remote areas and hopefully, you will enjoy the same sense of excitement as many of those early Explorers. Today, our landings come to an end as we enter the Drake Passage for our return journey to Ushuaia. With further on-board lectures to complete our Antarctic experience, there is still plenty of time to enjoy the magic of the Southern Ocean and the life that calls it home. There is time for reflection and discussion about what we have seen and experienced, and the impact this voyage has had on our attitude to life. 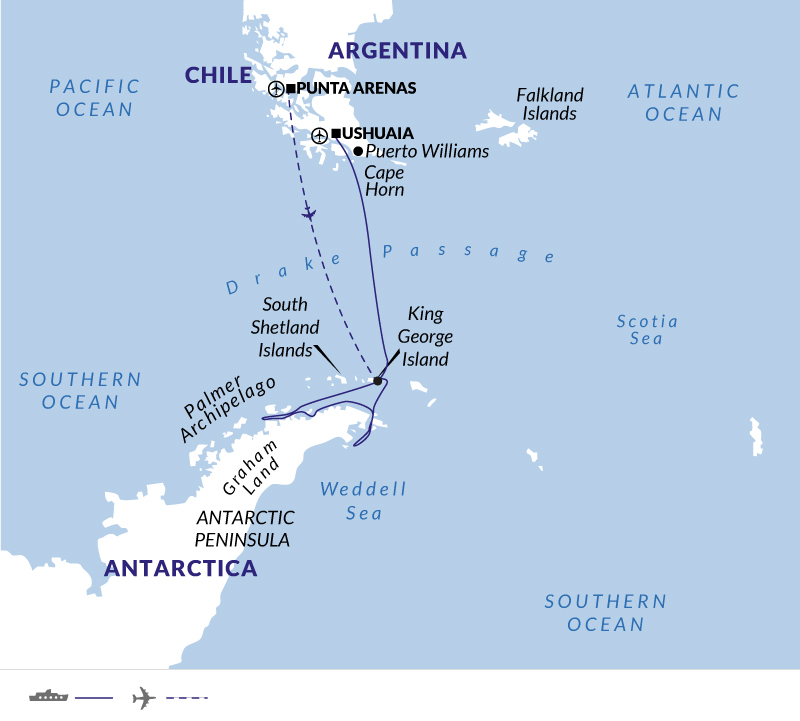 As we approach the tip of South America, our Captain may sail close to legendary Cape Horn, weather and time permitting. During the early morning, we cruise up the Beagle Channel, before quietly slipping into dock in Ushuaia. Dismebarkation will commence after breakfast. Bid farewell to your expedition team and fellow passengers, as you continue on your onward journey. Information There are no tranfers included on the last day of your tour. Please advise if you would like a quote for an airport transfer on this day.